This class will mix a dynamic standing sequence to build some heat and maybe a bit of sweat to then go onto the mat for deeper stretches, core work and relaxation. This is a faster paced class suitable those who have done Yoga before or have a good level of fitness. Teens are welcome (but please make sure under 16's are accompanied by an adult). "I approach life with a sense of wonder and enthusiasm. I was initially drawn to Yoga as a physical practice to keep fit and supple, but soon realised that it is so much more: a path of self discovery towards awareness, acceptance and contentment. I trained as a yoga teacher in Mysore, India, with the most influential teachers of Ashtanga. 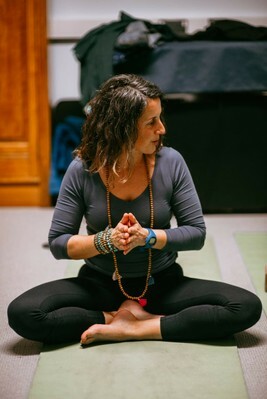 Since then, I have integrated other styles of yoga into my practice while learning with inspiring teachers in England, India, America and Italy. I currently teach Vinyasa, Restorative, Pregnancy and Postnatal Yoga around Axminster and on the River Cottage Wellness Retreats." for those who have done yoga before or are fairly fit We put these guidelines in place for the safety, comfort and enjoyment of all our guests.